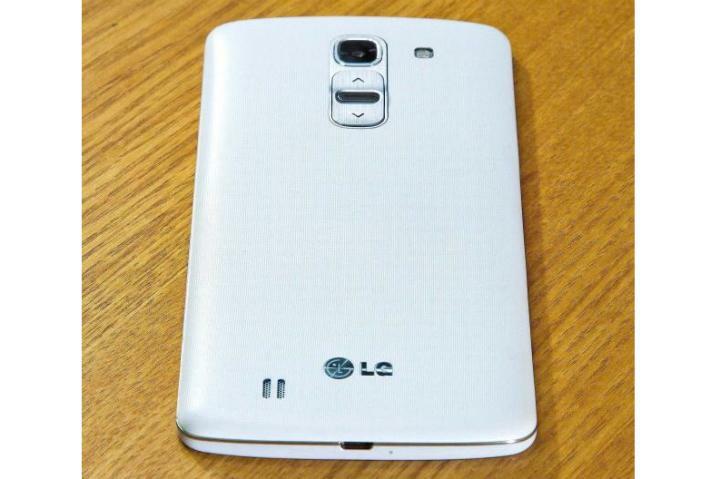 LG has already confirmed not only the G Pro 2’s existence, but also its impending arrival in February, but the final specs and its design remains unknown. However, the latter mystery may have been cleared up this week, as a pair of leaked pictures could show the G Pro 2 in all its glory. The two pictures potentially give us a glimpse at the phone from a side-on view, and from the rear, with the phone laid flat on a table. The side view shows the G Pro 2 is very similar to the original G Pro, particularly where the gently curving rear panel connects to the body. It’s round the back where things get far more interesting, as if the picture is accurate, LG will bring its rear mounted controls to the G Pro 2. Introduced on the LG G2 (which you can see at the top of this article) last year, the buttons let you control the speaker volume and power up the screen. Fitted just below the camera lens, we found them to be far more intuitive than one may have expected. If anything, the rear controls make even more sense on the G Pro 2 than they do on the G2. The larger the screen, the less likely you are to wrap your fingers round the device to comfortably adjust the volume. If previous rumors are to be believed, LG is going to bump up the screen size on the G Pro 2, perhaps to a massive 6-inches. There’s still some debate regarding the whopping display’s final resolution. An early rumor indicated the G Pro 2 would be LG’s first handset with a 1440p, that’s 2560 x 1440 pixels, resolution screen. However, there’s still a chance this will be saved for the LG G3, and the G Pro 2 will have to make do with a 1080p screen. LG says we’ll be introduced to the G Pro 2 in February, but wasn’t clear whether this would be during Mobile World Congress, or just before. Who needs water when you can wash your clothes with millions of polymer beads?